When it comes to the historically rich region of Mesopotamia, Babylon is arguably the most renowned of all cities. 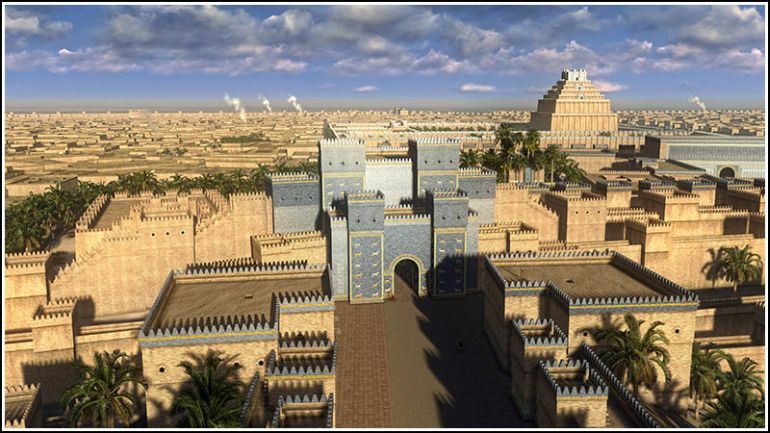 An ancient settlement that harks back to the dominions of Sargon of Akkad (circa 24th century BC), Babylon possibly started out as a small town in the backdrop of mighty cities like Ur, Uruk and Nippur. However by the time of the ascension of Hammurabi the Great (the sixth king of the Amorite dynasty) in 1792 BC, Babylon became the major capital of the city-state of ‘Babylonia’, known as Mât Akkadî or ‘the country of Akkad’ in contemporary Akkadian. The very term ‘Babylon’ is of Greek origin and it is possibly a rough translation of Babillu – which in Semitic pertains to the conjunction of two words Bâb (gate) and ili (gods), thus suggesting the location of Babylon as the ‘gate of the Gods’. Now from the perspective of history it should be noted that Babylonia as an empire was soon eclipsed after the death of Hammurabi, with the empire being consequently annexed by the Hittites (who even sacked the city of Babylon in 1595 BC) and then Kassites. Finally the war-hardened Assyrians came to the fore and claimed the city by early 8th century BC. All of these conquests targeted towards the city do however prove the importance of Babylon to the proximate invaders of the region, a pattern aptly demonstrated by the Assyrian king Ashurbanipal of Nineveh, who besieged and took the settlement (after a rebellion) and yet left it unharmed. The king even took the trouble to personally ‘purify’ Babylon from the evil spirits, thus justifying the royal city’s status as a place of culture and learning. Subsequently many Assyrian rulers treated Babylon as a ‘cultural’ capital, and advocated their inclination towards Babylonian civilization, institutions, and science. That was until king Sennacherib unceremoniously sacked the city in 689 BC, an act that was criticized by many contemporary people, including nobles of his own court. But like a phoenix rising from its ashes, it was a native soldier named Nabopolassar who was destined to expel his Assyrian overlords and restore the glory of the royal city of Babylon in 626 BC. Thus the Neo-Babylonian empire was founded, and the city reached its architectural peak under Nabopolassar’s son – Nebuchadnezzar, who reigned from 605-562 BC. Forever attracting the ire of Biblical writers for his alleged role in destroying Solomon’s Temple in Jerusalem (see the 3D reconstruction here), Nebuchadnezzar was also responsible (quite antithetically) for undertaking and renovating massive infrastructural and monumental projects inside the city of Babylon. The capital by then covered 900 hectares (2,200 acres) of land and boasted some the most imposing and majestic structures in all of Mesopotamia. The view from behind Etemenanki, across the cityscape. The architectural list included the completion of the royal palace (supposedly inlaid with ‘bronze, gold, silver, rare and precious stones’), an entire stone bridge that connected the two major parts of the city over Euphrates, the famed blue Ištar Gate, and the possible restoration of Etemenanki – a towering ziggurat dedicated to the Babylonian god Marduk (that has often been likened to the Biblical Tower of Babel). In fact, the fully refurbished Etemenanki would have been one of the tallest man-made structures from the ancient times, with its imposing height reaching around 298 ft or 91 m. Intriguing enough, a few ancient authors had also ascribed the construction of the Hanging Gardens of Babylon – one of the seven wonders of the ancient world, to Nebuchadnezzar. However recent studies have revealed how this landscaped masterpiece was perhaps located in the city of Nineveh or just a figment of imaginative writing. 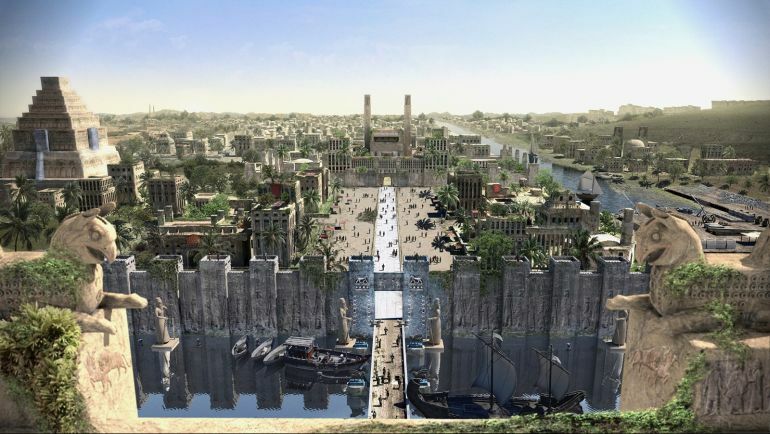 The video below presumably showcases the royal city of Babylon in its architectural peak during the reign of Nebuchadnezzar circa 6th century BC. 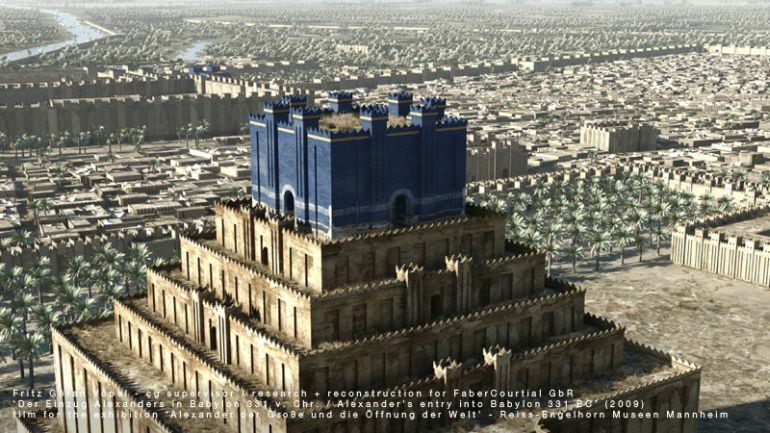 And while the animation does flaunt a bevy of gorgeous 3D rendering techniques, it SHOULD BE NOTED that the creators have taken some artistic license to demonstrate the grandeur of Babylon. Few of these ‘anachronistic’ examples would relate to the dressing style of the inhabitants (which seems more akin to later Arab styles) and the portraiture of Achaemenid Persian motifs on some walls.